Affordable, high-quality stump removal service. Have a troublesome stump you need removed? We can help! With over 5 years experience and armed with the latest in stump removal equipment, we are more than prepared to handle any stump you need removed. Residential, commercial, or industrial, if you have a stubborn tree stump that needs to be removed we can help. No stump is too large or small, we can remove them all! We are passionate about tree stump removal and take pride in delivering a service that not only meets your expectations but delivers satisfaction. All of our customers, from first contact to job completion, receive industry-leading service. Fill out the form on this page, or call us for a free tree stump grinding estimate. 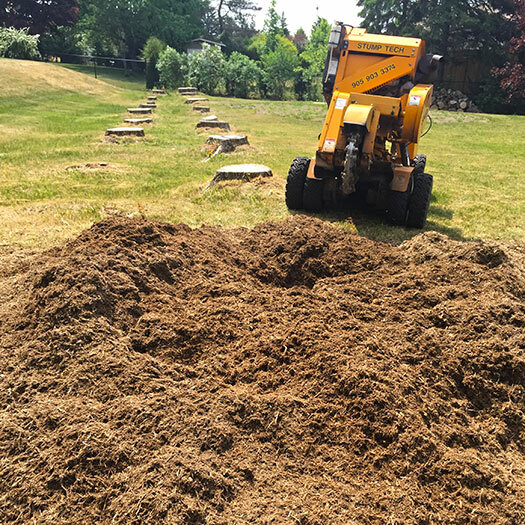 With over 5 years experience providing stump removal services, our knowledge and experience ensure accurate quotes and effective service. Customer satisfaction is our top-priority and we guarantee all of our work – we absolutely grind to the depth we say we will. Fully insured with up to $5,000,000 in public liablity, you can rest assured all aspects of the job are covered. Able to handle any sized stump removal project; our team is dynamic and we have access to a variety of stump grinding machines. Utilizing the latest technology and best safety practices, we carry out all work in a manner that is safe to property and nearby people. We provide affordable, fair pricing starting from $150 (+HST). Our minimum rate is not simply a call out fee. If you have a couple of medium sized stumps in an easy to access location your job pricing may only be our minimum rate. All quotes are dependant upon the circumstances of the stump removal job and include size of stump, grind depth required, and access to the stump. For all your stump removal needs, you can depend on StumpTech. For a free consultation, contact us today.